On our way from the west to the east of Ireland, we stopped in Kildare, the town which was home to St. Brigid, one of the patron saints of Ireland and, according to the stories, an abbess who founded a monastery in 5th and 6th century. Many stories link her to the older goddess Brigid, goddess of smithcraft, poetry, and healing. 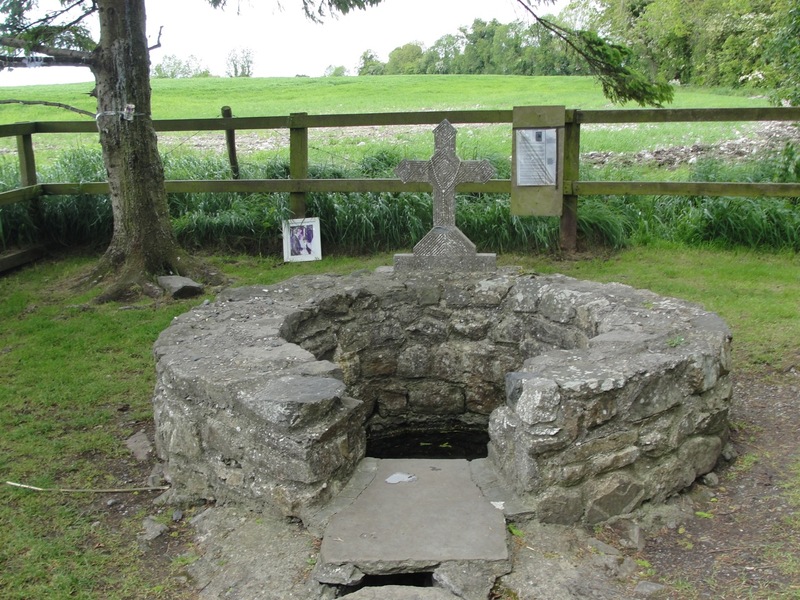 We had read that there were two Brigid’s wells in Kildare–one now designated for the saint, and a pagan well still associated with the goddess. Apparently, the pagan well wasn’t advertised, but we had read that it could be found near the parking lot of the Japanese Gardens/Irish National Stud. So we set out to find it. On the way, close by, we saw a sign for St. Brigid’s well and found that one. 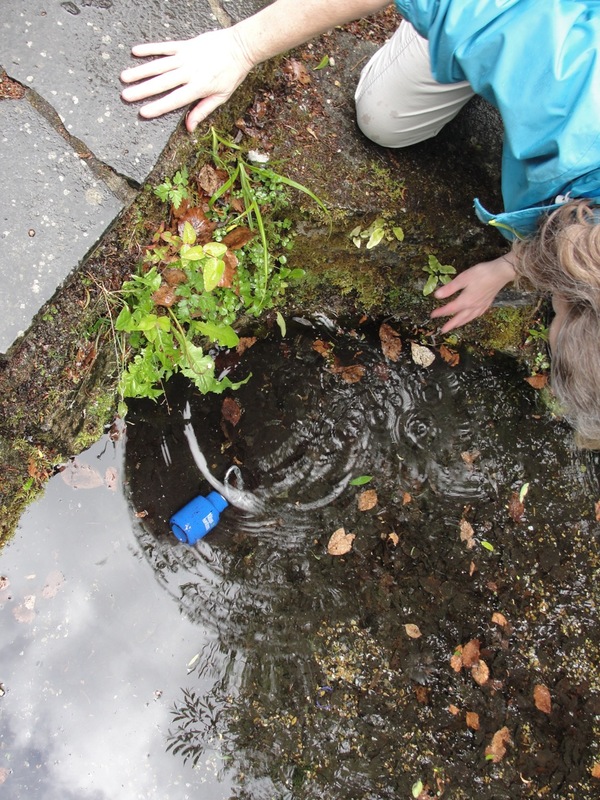 People come to the Brigid’s wells for the healing properties of their waters, and so we touched the water and asked its blessing. The well is shallow, about a foot deep, and is spring fed. We left a coin in the water along with our wishes. It is said that this well, too, may have ancient connections to the goddess Brigid, incorporated into Celtic Christianity as St. Brigid. There are other Brigid’s Wells all over Ireland. Then we went on to the Japanese Garden, and searched around the parking lot, but didn’t see anything. We went inside, and had a lovely lunch at the restaurant there. 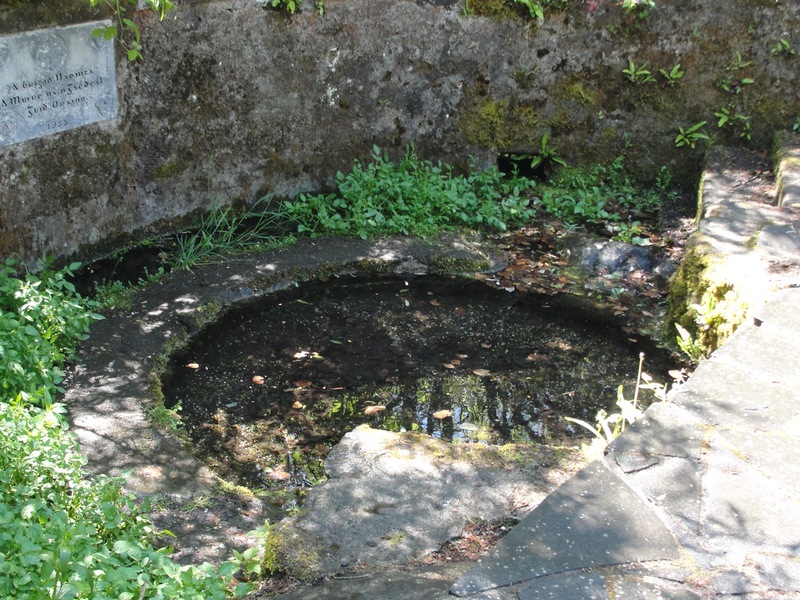 Afterward, we asked a man at the ticket counter about the second Brigid’s well, and he told us to go around to the other side of the parking lot, behind a little wooden gate. So off we went, and we found it. Totally unmarked on the outside, but set into a lovely little paved area, with a half circle of stone wall opposite that could be used as seats. Nearby, people had left ribbons on the branches (we saw those at the other well too). It was intriguing to Margy and I that these ancient sacred sites are so hidden in plain sight. I felt so delighted and awed to be in this place where healing waters have been flowing since ancient times. Margy and I drank a little water, and took pictures, and absorbed the magic all around us. Then, an unexpected encounter–I was down on the stones next to the well, with the camera, and Margy was on the stone pavement above, holding my backpack, and she leaned over a little, and suddenly my metal water bottle that was in the open pocket of the backpack fell right into the waters of the well. Those of you who know me know that this water bottle I carry has its own sacred role in always reminding me of the holiness of all water. When I saw it there on the bottom of the well, I remembered that I wanted to take some of Brigid’s healing waters to bring home with me. Was Brigid herself reminding me, and making a personal connection to us in this way? I have celebrated her holiday in February for many many years. So, I leaned in to scoop it out of the well, and then emptied its water into the nearby plants, and filled it with water from the well. After that, Margy and I sang some more songs, sent healing wishes to all our friends back at home, and left our own ribbon on the branches hanging over the well. If I may, I also send healing energy to you who are reading this. This entry was posted in Awake to Earth, Awake to Mystery and tagged Brigid, Goddess, Healing, Ireland, Spirituality, Water, Well. Bookmark the permalink. What a “magical spiritual” experience! How wonderful that you and Margy are together exploring Ireland. We went together as a family and we will never forget that rich experience. A lovely experience. Helps begin my day with a sense of the sacred even though I’m on the other side of the world. Thank you, and much love to you and Margy in your travels. I love this entry. Lovely to be in touch with you on your journey to Ireland! Thanks for this one especially as it resonates with my Fitzgerald ancestry. And thanks also for the healing wishes at the end as I am dealing with some pretty crazy stress. They must have reached me as I am dealing amazingly well with the situation!